Go played with rules amended so that neither player can pass, and a player without a legal play loses (suicide usually being illegal). Historically this was called nimgo by Bill Spight in the 1970s. (Also called Conway go by some, because there are no passes in combinatorial game theory.) No pass go is rather different from regular go. However, there is a form of no pass go that is quite close to regular go, no pass go with prisoner return. There is also another form that comes with Tromp Taylor Scoring. 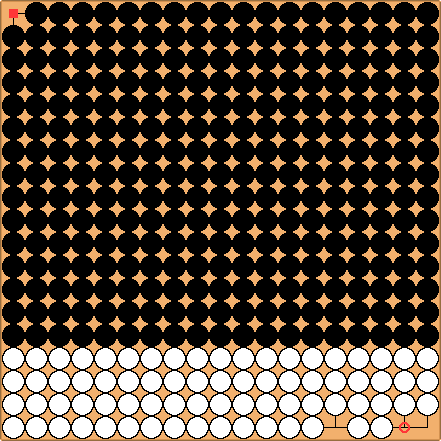 In this form, a player can pass only when there is no legal moves, and it will end the game immediately. Afterwards, a Tromp Taylor scoring rule apply and decide who wins the game. In other words, no legal play only consider the game should end, but don't determine who wins. Compare to the one with prisoner return this version does not enforce group tax (it can be added separately though). as well as a number of threads on rec.games.go for more detail (e.g. search for 'nimgo', 'no pass go', etc.). Black cannot take back, by superko. Can Black win 1x5 Nimgo? Black makes a strategic sacrifice. topazg: 7 is a suicide move is it not, with 5 having been removed by 6? Bill: captures the stone on the end, so it is not captured by . Now White cannot take back, by superko. Does Black have to sacrifice at move 3? Black can't play a because of superko, so must play . Apart from a different opening, what else can Black do? Black wins, but what if here? If its allowed, Black can't take it (standard ko), so black loses and it looks like 5x1 is a win for white since the black opening at fails. If it is not allowed, black has a winning strategy since white has no other move. Jasonred : Hmmm.. so, how much area or territory or prisoners over the course of the game doesn't matter, just make you opponent not have a legal play left? Bill: Research done mostly by the late John Rickard and myself suggests that moves are roughly proportional to territory. So on large boards the strategy should be much the same as regular go, but the endgame would be much longer. Jasonred : Why? Territory doesn't matter anymore, as you can play in your opponent's territory without a care. all you need to do is get as many separate eyes as possible, making sure that you haveenough that on you have a minimum of two eyes on your opponent's turn. Also, it's going to be really cool endgame, cause decision of kill or do not kill come into play. In this case, for example, don't ask how it reached that point, the correct play is at the circled point, the square there is just asking for havoc. As far as I can tell, this is just close to the only possible endgame position, the others being one side having 3 eyes to one eye ratio, or a ko, or superko, or somewhat. But this would probably be like the most common. Having 2 eyes isn't good enough anymore, you need more than your opponent. all in all, a weird game. I wouldn't mind a game of 9x9 Do Not Pass Go though. Any takers? Robert Pauli: I disagree to Lasker-Maas rules having any relevance in equalizing no-pass go with stone scoring (and with what else?). It's not liberating prisoners, it's releasing them! Bill: I fail to see the relevance of Lasker-Maas rules, too. After White sacrifices 3 stones to shrink Black's big eye down to 1 point, she fills one of her 3 eyes. Under unamended no-pass rules, Black is now forced to fill one of his 2 eyes and eventually lose the game - ignoring the fact that he is leading by 3 stones on the board. Allowing Black to liberate a black prisoner (after a balanced prisoner increase) and to fill his eye with that stone would serve him nothing. What he needs is the allowance to release a white prisoner (dropping it back into the supply) in exchange for not having to add a stone onto the board. Robert Pauli: What's the question, Bill? Bill: I am not familiar with the Yahoo rules, but I think that the rule stated simply introduces pass fights without turning the game into Nimgo. Robert Pauli: If you feel that passing is best, just do so. However, I'll pass too and disagree to the end, bringing the burden to play back to where it was. Why care to pass at all? I neither experienced it, and I don't know if passes lift the ko ban there, but it seems effectively to be no-pass go. At the end, one side will have no legal play and run out of time. The amended version, which allows passing by returning a captured prisoner as a pass stone, has also been called "no pass go with prisoner return". This ruleset (in a version permitting some suicides) was published as "The Most Primitive Go Rule", T. Yoshikawa, Computer Go, 13: 6-7, 1989, though it could well have been discovered earlier. Scans of this newletter are available at http://www.daogo.org/. Some example positions, with their CGT values, are given here.